GarageBand for iPad is a recording studio that attempts to merge aspects of its Mac-based cousin with an intuitive touch-based iOS interface. For the beginner, GarageBand is a lot of fun. Anyone lacking musical ability can leap right to the selection of 'smart' instruments, which do all the hard work for you. You create drum parts by dragging drums to a grid, and it will auto-strum or fingerpick simple guitar chords and play arpeggios on a keyboard for you. All you need to do is tap the name of the chord. Up to eight tracks can be added using the track editor, and individual tracks can have effects applied and volume and panning adjusted. You can also augment your smart instruments with a (slightly limited) range of built-in loops. To take things further, you must work with some form of more manual input, and it's here that GarageBand is a bit hit and miss. The drums are poor – the on-screen kits are perfectly 'hittable' but you only get six; worse, GarageBand's trumpeted accelerometer-based expression (tap the screen harder to make an instrument more forceful) lacks consistency and can't be disabled for drum tracks, making it nigh-on impossible to record uniform patterns. By contrast, GarageBand's fantastic for guitarists: armed with an iRig and a beaten-up old electric guitar, we hugely enjoyed experimenting with the app's selection of amps and customisable stomp-boxes. Despite the iRig's quiet output, we made a decent noise; the only pity was a lack of any timing assistance. For electronic musicians, the app's so-so. The instrument selection is best suited to dodgy 80s synth pop, and the lack of pattern editing in the track editor forces you to continually re-record to deal with errors, rather than dragging notes around; on the plus side, keyboard parameters can be tweaked, the customisable on-screen keyboard interface is excellent, and Apple has sensibly provided quantisation options to tidy up timing. Elsewhere, we enjoyed mucking about with the sampler, found voice recording workmanlike (and limited when it came to effects) and considered the app's approach to song construction-user-defined 'sections', somewhat akin to the desktop version's regions – awkward. We also had occasional performance issues, especially when working with a lot of effects. Recordings would sometimes cut out, and the app often has to pause to 'optimise performance'. This probably all sounds quite negative, so you might be surprised to hear that we nonetheless recommend this app. It's not perfect, and electronic musicians are far better catered for with NanoStudio or BeatMaker. But for the musically curious, this is a great toy, and for guitarists, there's huge value in the amps and stomp-boxes. It's also pretty clear that with a few tweaks, GarageBand could offer a similar amount of depth to its Mac cousin for a fraction of the price, and with the far more intuitive interface offered by the iPad. 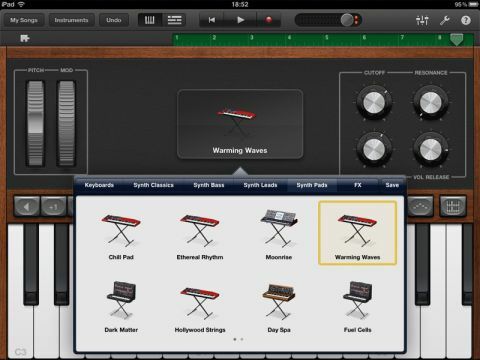 Frankly, we can't wait to see what Apple has planned for GarageBand's first major update.